A newly modernized Navigator of the Seas will debut February 24, 2019, and, onboard, passengers will find a number of new adventures available. Royal Caribbean’s $115 million upgrade includes a new Caribbean poolscape, two waterslides, a new blow-dry bar, and Insta-worthy nightlife and dining opportunities. 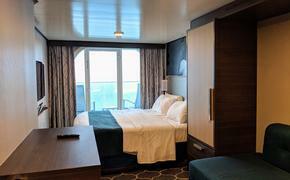 "Each Royal Caribbean ship brings a new adventure uniquely designed to deliver on our guests' preferences from A to Z," said Michael Bayley, president and CEO, Royal Caribbean International. "After launching our Royal Amplified modernization program with Independence of the Seas and then redefining short getaways with Mariner of the Seas, we are challenging ourselves to take it to the next level. Every detail matters, and we've mapped out an unmatched combination of innovative features and experiences for this top-to-bottom transformation of Navigator of the Seas." 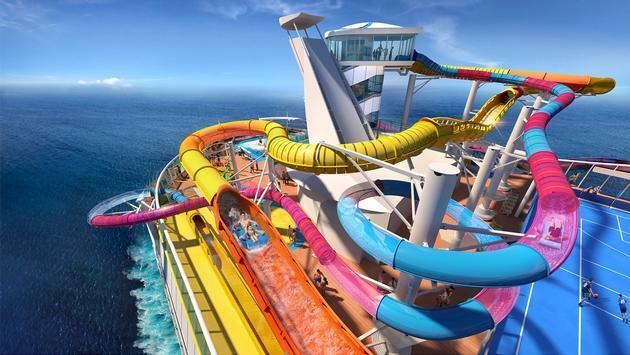 A pair of new waterslides dominate the newly refurbished top deck of Navigator of the Seas. The Blaster is the cruise line's first-ever aqua coaster and the longest waterslide at sea, and the Riptide is the industry's only headfirst mat racer. The entire poolscape has been modernized with a Caribbean theme and includes a Splash Pad for children, as well as signature Royal Caribbean features like the FlowRider surf simulator and a rock-climbing wall. Guests can also enjoy Lime and Coconut, a two-level signature bar that offers sunset views, live music and cocktails. Grab-and-go dining also features Mexican street fare at El Loco Fresh and American fare at Johnny Rockets Express. Guests will be able to grab drinks and a bite to eat at several new establishments. The Polynesian-inspired Bamboo Room, which made its debut on Mariner of the Seas, will be serving up kitschy-cool cocktails onboard. Playmakers Sports Bar & Arcade is the place to catch the game. There will be 50 big-screen TVs, tabletop games, tournaments, trivia, a new Owner's Box VIP room, and a menu of classic bar fare with a twist alongside ice-cold brews. For good eats, passengers can visit Jamie's Italian for a taste of celebrity chef Jamie Oliver's rustic Italian dishes. New England-inspired dishes like lobster, crab claws, local fish and just-shucked oysters can be found at Hooked Seafood. Coffee-lovers will be happy to note that there will also be a Starbucks onboard for pick-me-ups. Families will have a lot to look forward to when it comes to sailing onboard the Navigator of the Seas. Royal Caribbean hits such as glow-in-the-dark laser tag with Battle for Planet Z in Studio B, mini-golf and the Royal Escape Room: The Observatorium will keep kids busy. A reimagined Adventure Ocean youth program includes an open, free play space with organized activities. Teen areas have a hidden entrance and include a living room-style hangout as well as outdoor areas. When the Navigator arrives in Miami, she will sail five- and nine-night Caribbean itineraries before offering three-night and four-night sailings to the Bahamas, including Royal Caribbean’s private island, Perfect Day at CocoCay, starting in May.